The lengths to which the UN will to go to avoid any condemnation of Jew-hatred would be comical if they weren't so contemptible. Is that finally changing? http://www.jewishworldreview.com | A seminar on anti-Semitism was held at the United Nations this week. Secretary General Kofi Annan opened the program by rebuking "those who . . . continue to spread lies and vile stereotypes about Jews and Judaism." Elie Wiesel, the Holocaust survivor and Nobel peace laureate, delivered a moving keynote address. Three panels of witnesses spoke about the menace of anti-Semitism and how to combat it. The event was presided over by Shashi Tharoor, the undersecretary general for communications, who also delivered the closing remarks. All in all, you might think, a typical UN program  one of scores of gatherings the world body hosts each year on a wide array of human rights issues. The anti-Semitic hatred and violence seething in so much of the world are a grave international problem, so it stands to reason that the UN would make it the focus of regular and serious attention. Except that it doesn't. Monday's conference on anti-Semitism was the first in UN history. The United Nations was born nearly 60 years ago in the wake of the Nazi genocide against the Jews. Awareness of the Holocaust informs the UN's seminal documents, above all the Universal Declaration of Human Rights. Yet not once in its six decades  not until this week  had the UN ever convened a meeting to discuss the hatred or persecution of Jews. Not once has it adopted a resolution dealing specifically with anti-Semitism. Not once has it published a report on anti-Jewish racism or incitement. "Even when judged against the hypocrisy with which the UN has frequently treated its own founding principles," wrote legal scholar Anne Bayefsky, a professor at Columbia University Law School, in an important article in Commentary earlier this year, "the international body's abiding hostility to the just claims of Israel and the Jewish people remains a special, and especially egregious, case." Bayefsky's essay, along with an earlier piece in The Wall Street Journal, were devastating. From the UN's earliest years, she showed, anti-Semitism was the great evil it refused to notice. The first time a resolution dealing even partly with bigotry against Jews came up for a vote was 1959, a year "when some 2,000 anti-Jewish incidents . . . were reported in almost 40 countries." The original title of the resolution was "Manifestations of Anti-Semitism and Other Forms of Racial Prejudice and Religious Intolerance of a Similar Nature." But by the time it reached the General Assembly floor, the words "anti-Semitism" had been cut. The lengths to which the UN will to go to avoid any condemnation of Jew-hatred would be comical if they weren't so contemptible. When it adopted an international convention against racial discrimination, it refused to include a reference to anti-Semitism. "The Soviet Union, its satellites, and its Arab allies," noted Bayefsky, "insisted that anti-Semitism was a question not of race but of religion." Yet when the UN later adopted a resolution on religious intolerance, the lead sponsor insisted that anti-Semitism should be omitted because that was a matter not of religion but of race. The UN's 1975 resolution equating Zionism  the national liberation movement of the Jewish people  to racism was only the most notorious illustration of its anti-Jewish bias. 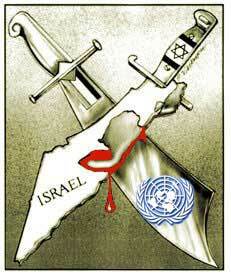 The measure was repealed in 1991, but the UN continues to anathematize the world's only Jewish state. The UN's 2001 Durban conference on racism and xenophobia, for example, turned into an anti-Semitic bacchanal. At times, the venom has sunk to medieval lows. "In presentations to the UN Commission on Human Rights," Bayefsky wrote, Arab delegates have trafficked in blood libels, "accusing the Israelis of . . . needing to kill Arabs for the proper observance of Yom Kippur and of injecting Palestinian children with HIV-positive blood." The professor's indictment got Kofi Annan's attention. Not only did he accept her challenge to convene a UN conference on anti-Semitism, he invited her to speak. She accepted the invitation, and delivered a speech last Monday the likes of which had not been heard at the UN since Daniel Patrick Moynihan blasted the Zionism resolution in 1975. She described the UN as "the leading global purveyor of anti-Semitism"  a place where "the language of human rights is hijacked not only to discriminate but to demonize." (The speech is online at www.opinionjournal.com). So has the UN arrived at a turning point? Or was Monday's conference merely a fig leaf  a PR response to some bad press? That depends entirely on the secretary general. It is up to Annan to take on the anti-Semitism within the UN's ranks  to insist that Israel's pariah status end  to denounce Jew-hatred as a dangerous scourge. In short, to show moral leadership and courage. Frankly, I doubt that Annan has it in him. But then I doubted that Annan would pay any attention to Bayefsky's powerful writings. I was wrong about that. Here's hoping I'm wrong again.